What started as a no-brainer day, ended up as a scrambled-brain disappointment. Leaving the motel I made a quick stop at McDonalds for two egg McMuffins and cheese (no meat) on a Big Mac bun (“First time anyone’s ever ordered that, sir.”). 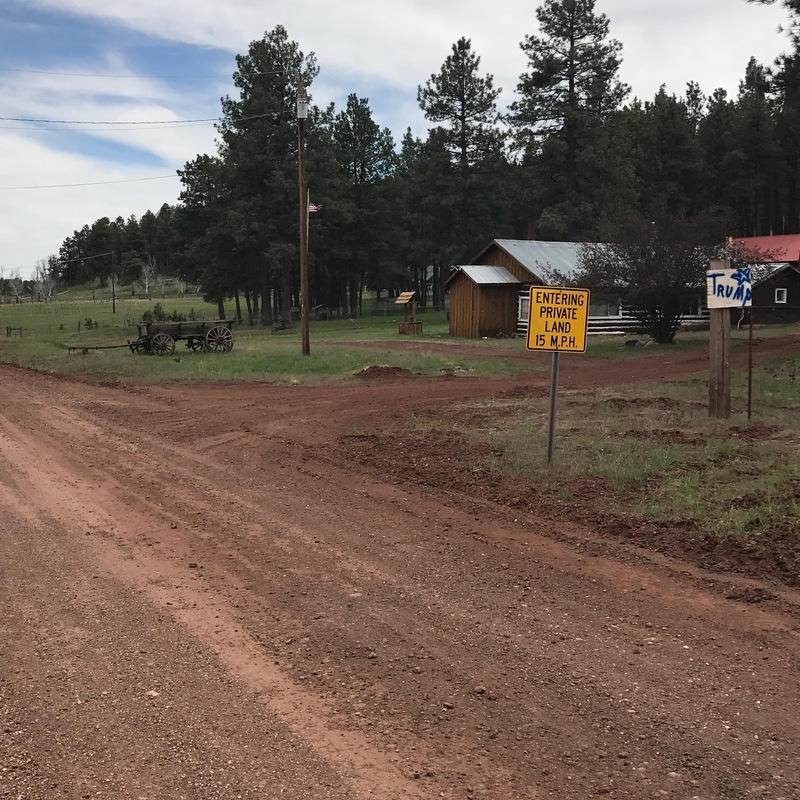 Then back to I-40 for a few miles until an Arizona Highway Patrol officer informed me, via an official written warning, that, “No, sir, it is illegal for pedestrians to walk on the Interstate. No matter what you were told.” (He agreed that, “Yes, cyclists are permitted.”) Ain’t that a kick in the head, and more discrimination against us pedestrians. So, a half-mile later I exited the Interstate and began walking on the Old Route 66 frontage road. There were fewer vehicles, it was quiet, I saw cows and horses and heard birds singing. So, other than the fact that there was no shoulder on the two-lane blacktop, life was good. Until it wasn’t. First I saw a sign indicating that the pavement was about to end; then, as I entered a wooded area, it did. I tried to wave down a passing pickup to ask if this dirt road went all the way to Bellemont. The guy didn’t even slow down (but he did manage to give me the finger). A second car, also driven by a young guy, didn’t stop either. Fortunately, the third car stopped (in it was a couple my age; it figures). The woman said, “Yes, it’s dirt just like this all the way to Bellemont.” That was another 10 miles! I saw no alternative but to continue. Then things got even worse as I saw the sign that said, “Entering Private Land.” (It was right next to a Trump for President sign, and the humor did not escape me). This was getting scary. Would I be prevented from continuing? Or escorted off the private land by some guy with a shotgun? None of that happened. After a few miles the pavement reappeared (the lady, thank God, was wrong). But the road was long, with hills necessitating an up-and-down effort for miles, with winds and temperatures that fluctuated wildly by the minute. Yes, it was a tough 23 miles today. I’ve looked at tomorrow’s options (walking from Bellemont to Flagstaff) and don’t like what I see—an illegal walk on I-40, or 20 miles of pushing my kart on dirt roads. Frankly, I’m angry and disappointed. Driving on “Old Historic Route 66” may sound charming, but walking on it is a whole other story.